Well, this wasn't a sweet greeting for Adam Levine. 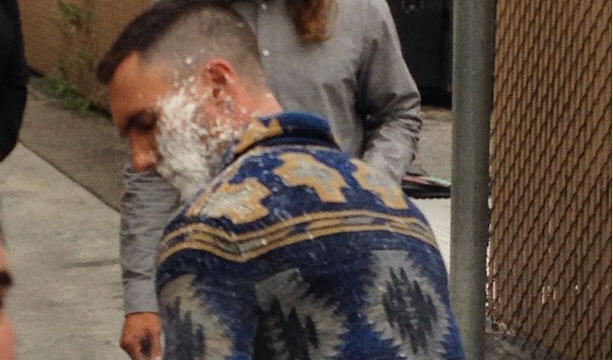 The Maroon 5 frontman and "The Voice" coach was sugar-bombed on Wednesday in Los Angeles. Levine was walking outside the "Jimmy Kimmel Live!" studio when someone pelted him with powdered sugar, covering half his face and most of what looked like a perfectly nice sweater. TMZ reports that the singer was greeting fans when the attack happened, and the prankster was detained by security and later arrested for battery. Levine appeared on "Kimmel" that evening to perform with Maroon 5 -- who, incidentally, have a song called "Sugar" -- and sat down for a chat with host Jimmy Kimmel that included a discussion about velociraptors.